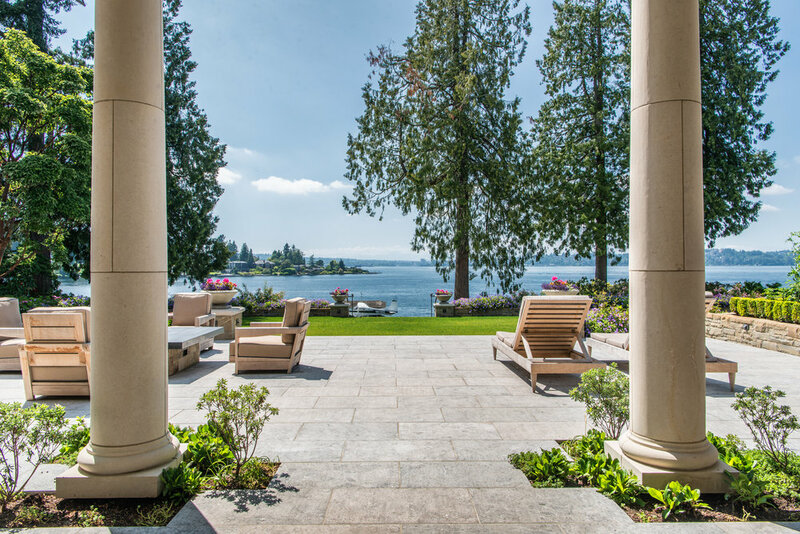 As Landscape Architects, we understand that the same scene can take on distinctly different moods depending on the climate, season, light, and how well site elements are working together. An artfully crafted composition of stone, light, and grasses can be beautiful throughout all seasons and times of year. Edges are used to organize space, create a sense of scale, and blend together indoor and outdoor spaces. The play of edges is essential to any exquisitely detailed and timeless landscape. The landscape creates the context, scene, and backdrop for this beautiful home in Bronxville, NY by Land Morphology. Edges are used to clearly differentiate between active areas such as lawn and more passive planted areas. However, edges can do more than simply demarcate space; they express composition and structure in concert with the architecture. The sense of scale is exploited in the above photo by the contrast of the large open space and clean-edged paths that frame this beautiful tutor-style home. As a result, the house is intimately scaled and nestled in the landscape. 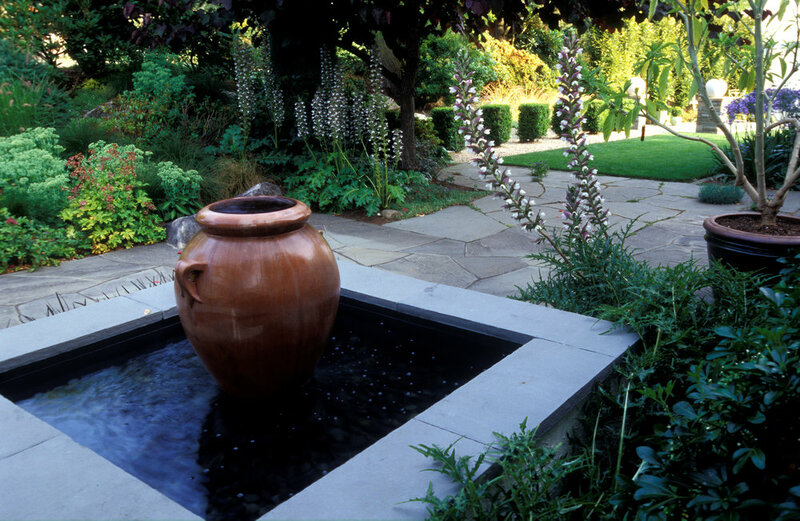 Here, an artful fountain and the sound of flowing water attracts and relaxes visitors in an outdoor garden room. Contrasting between natural or “soft” edges, and hard edges such as stone, can create a sense of order and create interest. Engaging as many of the senses as possible adds pleasure and liveliness to your garden. Water and stone together create a visually interesting surface and a relaxing sound. Many clients prefer the boundaries between indoor and outdoor spaces to be blended in a way that is seamless and pleasurable to the senses, especially those who entertain guests regularly. The playful interface between indoor and outdoor spaces carry the rooms outside and the garden inside along the edge of the house. Here, potted plants on bluestone pavers divide the active space from the passive in an attractive way. A repetitive rhythm of long, clean lines creates a sense of depth and transition. It’s important to note that this use of elongation and depth can be exploited even on small sites to create a sense of depth. In the foreground, two columns frame the horizon, the middle ground is punctuated by mature trees and lawn, while water serves as a background. The existence of all three: foreground, middle ground, and background are the foundation for any composition. Psychologically, horizontal lines are naturally more relaxing than vertical lines, while vertical lines denote authority and seriousness. This may be the reason why many find the long, unbroken horizontal line at the ocean to be so relaxing.